We at MS Machinery a leading manufacturer of Blister Sealing Machine, Garment Printing, Fusing, Heat press, and other textile printing machine. 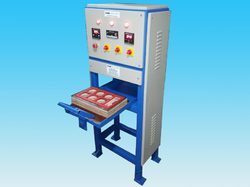 Our clients can avail from us high quality Blister Packing Machine that is manufactured using advanced technology by M/s. M S Machinery This machine is designed exclusively for making blister packs, and is widely used for packaging purposes in various industries, including pharmaceutical, and is available in wide range of Models to suit clients requirements. Being amongst the trusted names of the industry, we have been able to serve our valued clients with a comprehensive range of Semi Automatic Blister Packaging Machines. These machines find their wide applications in packaging of a number of items. Our range is designed with utmost precision by the experts. We also make sure that these machines perform flawlessly. Looking for Blister Sealing Machine ?